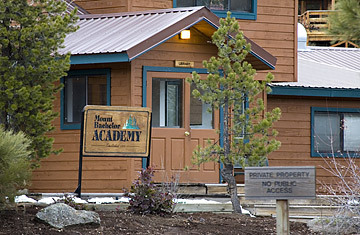 Mount Bachelor Academy, near Prineville, Ore.
What Does It Mean to Be 13? TA's case began in elementary school. He had trouble learning basic math, struggled to pay attention in class and could not finish his homework without his parents' help. In September 2000, he began attending Forest Grove High School. By December, he was failing or nearly failing most subjects. His parents had the school evaluate him for special education. TA's behavior and grades continued to deteriorate. He began smoking large quantities of marijuana. He was briefly suspended for bringing a knife to school. In January 2003, his parents took him to see a psychologist, who recommended that they enroll him in a wilderness program and then place him in Mount Bachelor Academy. Later in 2003, TA's parents sought reimbursement from the school district for Mount Bachelor's tuition, claiming that Forest Grove never properly evaluated their son for special education and therefore could not provide him the free and appropriate public education that was legally required. The district countered that, under IDEA, as revised by Congress in 1997, parents may seek reimbursement only after the child has already tried special education within the public system. The Ninth Circuit heard Forest Grove in 2008 and found that TA's parents had the right to seek reimbursement; otherwise, the court said, school districts could essentially avoid paying for special education simply by refusing to classify students as disabled. Presiding over a separate but similar case, however, the First Circuit Court came to the reverse conclusion, saying the law requires the child to try public special education first. In such instances, when the lower courts disagree, the Supreme Court is often called upon to clarify the law. Should the Supreme Court decide in favor of TA, says Naomi Gittins, deputy general counsel for the National School Boards Association, "it would be detrimental to the whole framework of collaboration to figure out what an appropriate education for a particular child is ... A lot of private schools for which parents want reimbursement don't have to meet state standards. How does that really serve the interest of children?" See TIME's Pictures of the Week.